Mukesh Ambani tops Bloomberg’s list as Asia’s wealthiest ! The global stock markets are somewhat out of the woods – and this has thrown up some interesting set of numbers in terms of list of the world’s richest people. However, there is a twist in the tale – until now, we were familiar with the Forbes list of billionaire club that announced the list of wealthiest people in the world on an ‘annual’ basis. But, for some, this was too long a waiting period to get the list of the elitist people in the world. This said, here we have debut of a truly new kind of rich list – the Bloomberg Billionaires Index – that updates the ranking of the world’s 20 richest people on DAILY basis, by calculating net worth of the wealthiest people on the globe on most transparent estimates available. For instance, if you want to know what’s cooking on with the net worth of business tycoon Warren Buffet, you can fetch latest data on Bloomberg’s ranking index; whereas if you log on to Forbes data for the same, you get the picture last updated as of November 2011. Expectedly, Mexico’s telecom czar Carlos Slim Helu tops the list of billionaires by Bloomberg with net worth of $68.4 billion as of March 5, 2012. Going by Forbes data, the estimated net worth of this richest person on Earth was pegged at $63.3 billion as of Nov 2011. Moreover, the coveted 2nd and 3rd position in the list of the billionaire club has been notched by business tycoon-turned-philanthropists – Bill Gates and Warren Buffet – with a net worth of $62.1 billion and $44.3 billion respectively, as per the dynamic measure of Bloomberg index based on changes in market, economy and current exchange rates. Mukesh Ambani emerged as Asia’s richest person with a net worth of $26.5 billion, even as the shares of Reliance Industries under-performing big time on the Indian bourses. 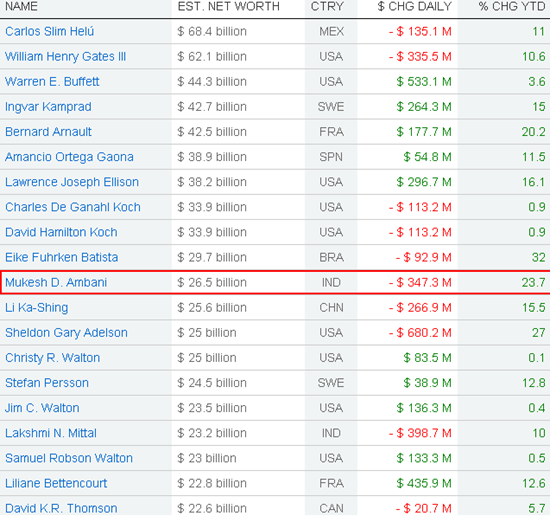 Unfortunately, Forbes had ranked the elder Ambani brother at No.9 in terms of richness a year ago, but under the Bloomberg data Mukesh Ambani is pushed back to No.11, ahead of China’s wealthiest Li Ka-Shing. Lastly, steel baron Lakshmi Mittal is the only other notable personality in top 20 list of billionaire club from India’s perspective, to be ranked at 17th position of glory with a net worth of $23.2 billion. Just want to say that this great personality makes the country proud! Hope this wealth also helps in the development of the country and people too. I will consider it as positive sign for Indian industry as Mukesh Ambani is leading from front. Congratulations to Mukesh Ambani ! !